A bunch of leaders in NYC’s Muslim community have declined Mayor Mike Bloomberg’s invitation to an interfaith breakfast because of the racial profiling done by the NYPD’s intelligence division. It’s interesting, too, for the obnoxious editorial written in response from the NYDN. Along with lecturing these Muslim leaders about what invitations they should accept, the NYDN claims that the NYPD had done no more than map out census data. The plain and salutary fact is that the NYPD’s counterterrorism unit has done no more than use census data to develop a portrait of Muslim New York and then follow leads, some sent the city’s way from abroad via the CIA, when they demanded investigation. Many a plot has been disrupted by this type of perfectly proper nonintrusive vigiliance. 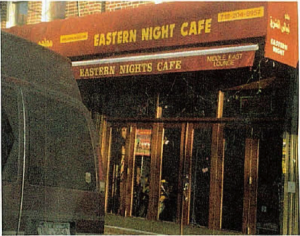 I find the claim that this all came from census data alarming, given that the NYPD has actually cased out a bunch of Middle Eastern restaurants in the city, including details such as what back passages the restaurants have, as in these details about the Eastern Nights Cafe. The restaurant consists of two stores next to each other, connected to each other from the back of the store. The restaurant also has a back yard. The restaurant has access to the basement; the access door is located on the far right of the store. Note, too, that while NYDN might be speaking generally about the “many a plot” that has been disrupted by mapping the back hallways of NY restaurants, this surveillance has not only disrupted primarily aspirational plots, but it damaged the FBI investigation into the real plot Najibullah Zazi had planned, because one of the NYPD’s own informants tipped the Zazis off to the investigation. And the invitation declination is interesting, finally, for the way the Muslim leaders framed this issue–as part of a larger choice on the part of the NYPD to neglect law enforcement while it engages in civil rights abuses not just of Muslims, but of people of color and Occupy Wall Street protestors. Mayor Bloomberg, the extent of these civil rights violations is astonishing, yet instead of calling for accountability and the rule of law, you have thus far defended the NYPD’s misconduct. We, on the other hand, believe that such measures threaten the rights of all Americans, and deepen mistrust between our communities and law enforcement. We are not alone in our belief. Many New Yorkers continue to express a variety of concerns centered on a lack of law enforcement accountability in our city, from stop and frisk procedures in African American and Spanish-speaking communities, to the tactics used in the evacuation of Zuccotti Park. That’s really what the NYPD surveillance is about: prioritizing the profiling of an entire community (even while periodically and repeatedly stopping and frisking totally innocent people of color), rather than investigating and solving actual crimes. Wow, that bit from the NYDN is an amazing piece of work. It’s not often you see writing that manages to contain more lies than nouns. Not to be labor the point, but taking the first noun phrase (The plain and salutary fact), I count three lies. What follows is not a fact and it is neither plain nor salutary. The demographics of Manhattan Chinatown may be of more interest. I became interested after my recent trip to NYC, where I noticed that the Chinese population seems to have increased dramatically. [A friend’s] … place is on the edge of Chinatown, although you didn’t notice before. Now they are spilling over to the rest of lower Manhattam. Most of these people, who are unbelievably rude and unpleasant and speak no English. They also cough in your face, spit in the street and drive in a vicious manner. It was obvious to me that most of them were illegals. But the most interesting thing to me is that this is allowed to continue because the CIA et al believe that the Chinese criminal gangs might eventually prove useful if there is a collapse of China’s government or some form of insurrection. They are being held in reserve as sort of a “Third Force,” as Graham Greene once put it. Forgot to mention: the criminal gangs, tongs etc. in the US are controlled by elements of the old nationalist Kuomintang, based in Taiwan. This is how Taiwan maintains control over US Chinatowns. Totally OT – Given the latest Repug Presidential polls, it appears that Nuts for Newt!™ have instead become Nots for Newt!™. @JThomason: Hmmm. I’ve been visiting relatives on the outskirts of Chinatown my entire life, and “They also cough in your face, spit in the street and drive in a vicious manner.” sounds like business as usual. For years, there’s been a sign inside the Chinatown USPS branch saying, “No Spitting”. On the amount of illegal activity and undocumented residents, you’re absolutely right. I’ll admit my correspondent does have a knack for the sterotypical. But there is a really intriguing story here. The author of the New Yorker aritcle expanded the work into a 400 page book which was reviewed in the NYRB in Nov. 2009. The “third force” reference was in response to gang activity being apparently tolerated. They also cough in your face, spit in the street and drive in a vicious manner. Sounds like the typical Houstonian to me. In our defense, Houstonians are typically overly polite (except when driving) and most of us speak a dialect of English that is somewhat understandable to outsiders. On the other hand, in my personal experience, the very best “citizens” of Houston are our undocumented residents. Well resident citizens are obviously of a different order than criminal gangs and not all members of any ethnicity are susceptible to stereotyping as being more or less prone to criminal activity. I think that is the point of EW’s post and it is a point well taken. Still “Cartel” activity is not tolerated and the persistance of stereotypical perception with respect to the illegal Chinese Madame Ping delivered is an emergent social phenomenon. I am not really sure what it means but the suggestion of an implication to Chinese politics is intriguing, much in the same way that the same way that the suggestion of Islamic identity can be used to suggest Al Qaeda. See e.g., http://www2.tku.edu.tw/~ti/Journal/8-1/812.pdf and see also,http://digitallibrary.usc.edu/assetserver/controller/item/etd-Lagdameo-2050.pdf . The conspiratorial suggestion of Chinese involvement in Cartel activity may at this point be ungrounded but organization plus military resources and political alliance are all that are necessary for some sort or insurgency/counterinsurgency dynamic to emerge. Apparently strategic thinking in the intelligence game plays on these ethnic identities. And the broader point that the diminishment of civil rights has the overall effect of bolstering the mystification of ethno/political warfare is probably also true. I had written very long reply to this which jusxtaposed the nuances of “intelligence needs” and “civil rights” concluding that maintaining the practice of civil rights probably aided in the demystification of ethnically drawn rhetoric in propogating armed conflict, but alas the reply was gobbled up somehow. The NYPD spy units, trained by the CIA, messing with setups by the FBI reminds me of Mad Magazines SPY VS Spy or Pitchers poaching Poachers, pitching Pitchers…. A pox on all their houses. @William Ockham: Certainly, no one would call Wall Street’s banksters unfailingly polite or law-abiding, traits that most undocumented workers adopt out of self-preservation, whether they stand in line, waiting for work, near the Whole Foods on 15th and P in DC or near the Lowe’s and Home Depots across America. Self-preservation for banksters means being as prickly, grasping and demanding as possible, so that any “negotiated” loss from their aspirations leaves them well ahead of where they started, and just as immune from the receiving end of a prosecutor’s whip as they were before their latest demand. I haven’t seen day laborers around the local Lowe’s stores, but they do haunt both Home Despot and U-Haul locations. It still violates the NYC Code on the subject, and that detail is still being ignored in the reporting. And, in conjunction with my comment on a later thread (#1) one wonders what controls governments that ignore laws [and court rulings] they don’t like. I’ll take peasants with pitchforks and torches for … What? AGENT SMITH: As you can see, we’ve had our eye on you for some time now, Mr. Anderson. It seems that you’ve been living two lives. In one life you’re Thomas A. Anderson, program writer for a respectable software company. You have a social security number, you pay your taxes, and you… help your landlady carry out her garbage.